65 Dwight Street is very close to the Medical District. 65 Dwight Street: 77 large units in 9 townhouses, occupying a full city block, with several landscaped courtyards. This property has the feel of a small campus. There are 12 1-bedroom flats (600 sq feet); 2 2-bedroom flats (728 sq feet); 24 2-bedroom duplexes (854 sq ft); 21 3-bedroom flats (914 sq ft); 10 3-bedroom duplexes (1050 sq ft); and 8 4-bedroom duplexes (1179 sq ft). Renovated units have luxury touches such as balcony, completely new bathroom, new kitchen with dishwasher, new wall to wall carpet. Available apartments at 65 Dwight Street include heat and hot water. Secure, enclosed garages, for an additional charge, as available. 2 bedroom townhouse $1,450 INCL Heat & Hot water. 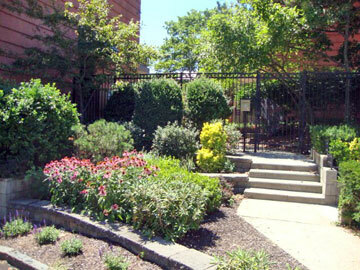 Spacious two bedroom townhouse space close to YNHH and medical centers. New hardwood floors on the main living level and carpeting in the bedrooms. There is also a small balcony attached to the living room plus paid on-site laundry and parking. Please note that the photos are representative of the space and some details may differ (like flooring). 2 bedroom townhouse $1,590 2 bedroom townhouse conveniently located within walking distance of Yale, New Haven hospital, and medical school. This apartment features an updated kitchen with oak cabinets and a dishwasher. Open living room/dining room area with hardwood floors and a balcony. Both bedrooms upstairs have carpet and good closet space. The heat and hot water utility costs are also included in the monthly rent. 2 bedroom townhouse $1,650 Spacious and bright 2 bedroom 1 bathroom townhouse with hardwood floors on the first floor and carpet on the second floor. This apartment features a new galley kitchen with granite counters, dishwasher and built in microwave. Small balcony off the living room, and renovated bathroom. Lots of closet space in this apartment as well. 2 bedroom townhouse $1,650 Hardwood floors throughout this 2 bedroom townhouse apartment. Modern kitchen with oak cabinets, granite countertops, stainless steel appliances and dishwasher. Large living room and dining room area with a balcony. Top level has both bedrooms with ample closet space, updated bathroom & linen closet. 4 bedroom townhouse $2,500 Great space in this 4 BR, 1.5 bath townhouse with renovated kitchen featuring granite counters, a huge breakfast bar, new appliances, and dishwasher. Hardwood floors in the living room and carpet in the bedrooms. Small balcony off the first floor, 1/2 bath on the first floor as well. All 4 bedrooms are located upstairs with good closet space, full bathroom upstairs has been renovated and has a linen closet as well. 3 bedroom flat $2,010 Lots of space and updates throughout this three bedroom flat. The apartment opens to a spacious kitchen with updated appliances, breakfast bar and granite counters. Flow into the living room with hardwood floors and a balcony. Down the hallway there are three large bedrooms, each with their own ample closet space and hardwood floors. The bathroom is recently updated as well, and provides a full sized tub. This is a great apartment! 4 bedroom townhouse $2,450 Great space in this 4 BR, 1.5 bath townhouse with renovated kitchen featuring granite counters, a huge breakfast bar, stainless steel appliances, and dishwasher. Hardwood floors in the living room and carpet in the bedrooms. Small balcony off the first floor, 1/2 bath on the first floor as well. All 4 bedrooms are located upstairs with good closet space, full bathroom upstairs has been renovated and has a linen closet as well. 2 bedroom townhouse $1,610 Updated 2 bedroom 1 bathroom townhouse with hardwood floors on the first floor and carpet on the second floor. Updated kitchen with dishwasher. This is a great location near most Yale Grad programs. 2 bedroom townhouse $1,640 Spacious and bright 2 bedroom 1 bathroom townhouse with hardwood floors on the first floor and carpet on the second floor. This apartment features a modern kitchen with granite counters, dishasher and built in microwave. Small balcony off the living room, and renovated bathroom. Lots of closet space in this apartment as well. 3 bedroom townhouse $1,950 Fully furnished three bedroom townhouse apartment with small balcony. New hardwood floors in the main living area and kitchen, carpeting in the bedrooms. Apartment furnishings include a couch, coffee table, end table, and lamp in the living room. Bedrooms come with a full sized bed, dresser and lamp. Rent includes heat and hot water! 3 bedroom townhouse $2,025 Spacious & furnished three bedroom townhouse with large living room area that features new hardwood floors and a balcony. Galley kitchen with good counter and cabinet space. All three bedrooms are carpeted and have good space and light. The apartment is 1050 SF and has great space and ample storage/closet throughout. Furnishings include a couch, coffee table & end tables in the main living room. Each bedroom has a full sized bed, dresser and lamp. 3 bedroom townhouse $2,085 Furnished three bedroom townouse with renovated kitchen with granite counters, breakfast bar, dishwasher and new appliances. Furnishings include living room couch, coffee table, TV table and end tables. Bedrooms have a full sized bed and dresser.